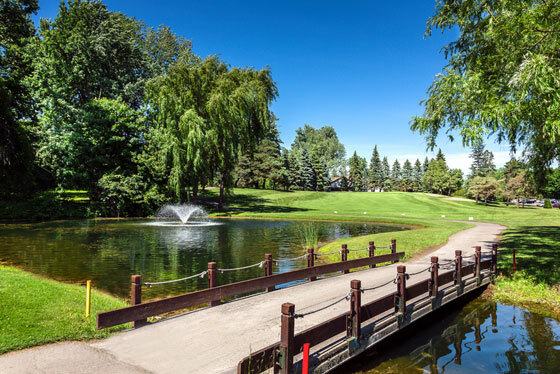 Montrealer’s have been chasing the little white pellet up and down the fairways of Le Club de Golf Rosemère since the early 1920’s. Located within this north shore, off-island suburb, at the intersection of Autoroute 640 and Labelle Blvd this James Buchanan layout has stood the test of time. Low handicappers will face a shot making challenge from the back tees where equal amounts of power and finesse are rewarded while players of novice or intermediate abilities playing from the appropriate tees will find this layout a pleasurable and rewarding experience. This charming historic layout is surrounded by a thick ring of large trees and provides a remarkable sense of seclusion considering the hustle and bustle of the neighbourhood. Although the course is located in a residential community the housing only backs on to a handful of fairways while the motorways boarder two side of the property. The piece of property can be characterized as generally flat however there are several small hills and swales that give the typography some character while several ridges run through the property adding more definition to the landscape. Buchanan located several of the green sites on or against these hills and ridges creating some challenging raised false fronted greens where the yardage on the approach shot plays longer than the number shown on your rangefinder. To add additional challenge the fairways are lined with mature trees many towering over the edges of the fairway playing havoc with wayward tee shots. Accuracy off the tee and solid distance control with the irons are two skills that are put to the test at Rosemère. The course opener appears on the scorecard to offer a reasonably benign welcome to the course. This handshake hole measures a mere 365 from the tips, however, this handshake has a rather firm squeeze and requires your full attention. A long iron or utility is the prudent play off the tee to the corner of the dogleg. The hole then swings downhill to the left from the dog leg corner to the green that is protected by a right side pond. The green slopes severely back to front twhile guarded in the front by bunkers left and right and a small bunker back right will capture the aggressive approach that releases long. The backside opener is a wonderful example of Buchanan taking advantage of the natural terrain to create a thought-provoking hole design. This straight away par 4 posts a yardage of 365 to 392 but can play considerably longer. The gently rolling tree-lined fairway culminates in a swale some 80 or 90 yards shy of the green that rises sharply at the green complex which sits atop one of the aforementioned ridges bisecting the course. The added elevation of the false fronted putting surface will require as much as one full club on the approach shot. Additionally, the prevailing wind is also known to fight the ball flight and may add another half club. Falling prey to the deception of the hill and wind is the norm on this hole so coming up short is standard practice leaving a tricky chip uphill to a very fast sloping putting surface. The wise player will take the drive long down the left-centre and on the approach take dead aim at the centre of the green (with lots of extra club) and then putt to the edges. Par is a very welcome score. Hole number 14, the final par 3 on the routing, is a beast that can play up to 220 yards, however, it is uphill from tee to green making the hole play much longer. The green is fairly generous as is to expected on a beastly long par three, however bunkers flank the green and white stakes behind offer plenty of opportunity for the big number to come into play. Rosemère is one of those courses that you could play every day and not grow tired of the routing. You will likely use every club in the bag during the round and if you have creativity in your shot making and a tidy short game a good score can be posted. It’s a fun course and although technology has softened course a wee bit, the design has stood the test of time.